We have already come over few data recovery software earlier to recover the lost data which or important, that might be deleted unknowingly or loss due to hard drive crash, formatted or damaged hard drive, virus infection and some other reasons. Win Data Recovery Software is free comprehensive data recovery software to recover data on major windows operating system, recovers data that emptied from the recycle bin or the above mentioned means. 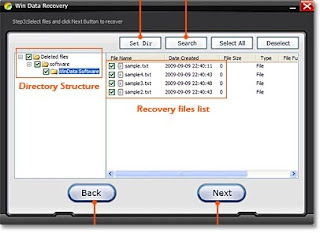 The recovery process is quick and it recovers almost all major file formats text, exl, pdf, bmp, exe, html, jpg, avi, mp3, etc.., You are let optional either with recover deleted files or all files from hard disk, you can get back the deleted and formatted files back easily and qickly. 2 Recovers deleted files, even after emptying the Recycle Bin. 3 Disk data recovery from crash hard drive. 5 Save Scan. Automatically save the scan result. 6 Read only. It recover data without rewriting to the drive. All operations are safe to the hard drive.